When you meet your friends for a run, do you make an outline of things you want to discuss? Of course not, so why should the hosts of a running podcast do it? That’s the approach Joanna E. Russo, William E. Docs (that’s not his name) and Chris Farley have taken with Pace the Nation, the weekly podcast they’ve been doing out of Docs’ Clarendon home since April 2015. Guests, too, are often last-minute propositions, any lack of planning is rescued by the hosts’ combination of quick wit (Docs), overall direction by Farley, and relatability Russo brings to the group as the straight man. 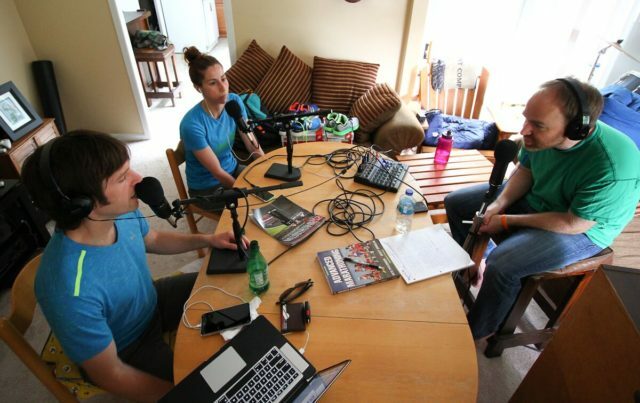 Farley (Yorktown) and Docs (West Springfield) grew up running in Northern Virginia and have done a podcast together before, so Russo’s rural New Jersey perspective serves as an entryway for other non-native D.C. area residents to access the show. Along with high profile guests like world championship 1,500m runner Kerri Gallagher and Olympic 5k runner Julie Culley and their coach, Matt Centrowitz, some guests have gained a following as a result of their appearances on the show. None perhaps as much as Todd Sadowski, best known as Sandwich Todd, who went from anonymous mid-packer to scrappy underdog when he decided to train so he could challenge the elites at the .US National 12k. He regales listeners with his progress as he strives for that goal. Likewise, the show has gained a cult following. A mid-August 2015 happy hour brought out a crowd of between 20 and 200 fans to meet the hosts. “There was no way to tell who was there for the happy hour and who wasn’t,” Docs said. Despite 20-plus weeks of winging it, they’ve developed some callbacks that reward loyal listeners — Edison bulbs, the Clarendon Pacers construction updates, Russo’s father’s forays into Twitter, machetes seen on the run, Farley and Docs’ fake fraternity of University of Virginia runners and And there’s plenty of time for serious discussion, touching on sponsorship issues in professional running; safety issues from cars, bikes and harassment while on the road and a tribute to Farley’s father, Chris.